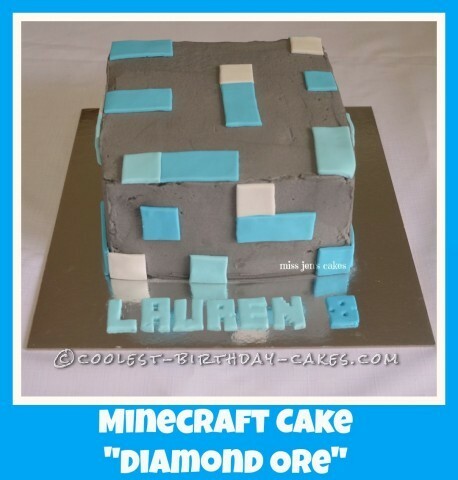 This Minecraft Diamond Ore cake was ordered for an eight year old girl, she drew me a picture using MS paint and my son who is a Minecraft fan showed me Diamond Ore in Minecraft on the iPad. I baked two 20cm square vanilla cakes colored blue using a triple butter cake recipe, putting 1.5 batter in each tin. I made a tripe vanilla butter cream recipe, colored it grey using a small amount of black food color. I put 1 cup of butter cream between the two cakes. Then I did a crumb coat, put it back in the fridge for half hour and then covered in more butter cream. To make the diamonds, I colored some white fondant in 2 different blues using Sky Blue food color and left some white. I cut the rolled out fondant into 1 inch squares and 2 x 1 inch rectangles. Minecraft font download, typed the name in MS Word and cut it out as a template, then I cut the name from the rolled fondant using a sharp paring knife.